Thanks to one man’s devotion to our region’s ecology, Natural Land Institute has spent six decades protecting the wildlife habitat, wetlands and scenic beauty inherent to northern Illinois and southern Wisconsin. Jermaine Pigee explains how the organization’s founding vision has propelled this group through decades of growth and change. 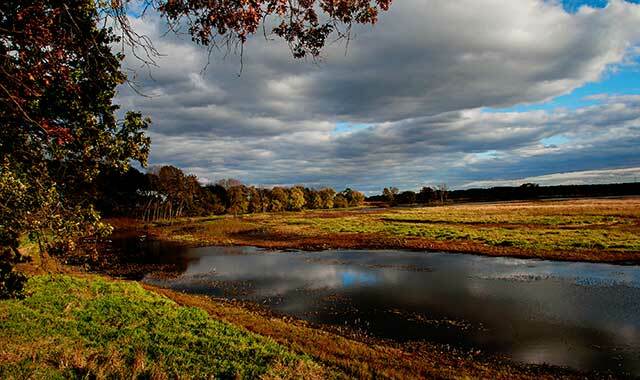 Nygren Wetland Preserve, in Rockton, is a 721-acre wildlife refuge that the Natural Land Institute purchased in 2000. Among other things, the preserve serves as a repository for a local diversity of plant species found in the region. NLI maintains the preserve and allows the public open access. Christopher Reisetter believes everything around us is tied back to nature. These are the reasons why Reisetter has spent six years as a devoted volunteer for the Natural Land Institute (NLI). other water species. NLI also educates people about their role in nature while giving people opportunities to enjoy natural areas. NLI is one of the oldest conservation organizations in the Midwest. Since 1958, NLI has protected and restored more than 17,300 acres of land throughout Illinois and southern Wisconsin. These areas include prairies, forests, wetlands and river corridors. Some of the land NLI has acquired over the years includes Harlem Hills Nature Preserve, Rockton Nature Preserve, Sugar River tracts, Nachusa Grasslands, Markham Prairie and the Castle Rock area. One preserve that’s open to the public is the Nygren Wetland Preserve in Rockton, Ill. It’s a 721-acre wildlife refuge that NLI purchased with grants and donor contributions in 2000. Restoration of this land has increased animal habitat, and Raccoon Creek, which has been restored to its original form, runs through the preserve. Nygren Wetland Preserve also serves as a repository for a diversity of plant species found in the area. Seeds were collected from surrounding lands and planted on the protected preserve. NLI serves 12 counties in northern Illinois: Boone, Bureau, Carroll, DeKalb, Henry, Jo Daviess, Lee, Ogle, Rock Island, Stephenson, Whiteside and Winnebago. Although they may do some of the same things, NLI is separate from a park district or a forest preserve. George Fell founded NLI as a private nonprofit charitable corporation on Dec. 24, 1958. He and his wife, Barbara, devoted their lives to protecting the natural areas of Illinois. They were also committed to protecting Illinois’ natural heritage and wanted to ensure that endangered plant and animal species would survive. George served as NLI’s executive director until his death in 1994. Barbara died about two years ago. Even after their deaths, the Fells’ legacy lives on at NLI. In 1950, George and Barbara traveled to Washington, D.C., to organize The Nature Conservancy (TNC). George was the executive director from 1950 to 1958. Today, TNC has become the world’s largest conservation organization. Under George’s leadership, Illinois also became the first state in the nation to create a system of nature preserves. He drafted legislation establishing the Illinois Nature Preserves Commission, which assists landowners in protecting natural areas of endangered and threatened species. Through NLI, George created additional legislation that would, among other things, acquire land, establish and maintain nature preserves and hire staff. Thanks to his efforts and determination, the Illinois Nature Preserves Act was signed into law in 1963. 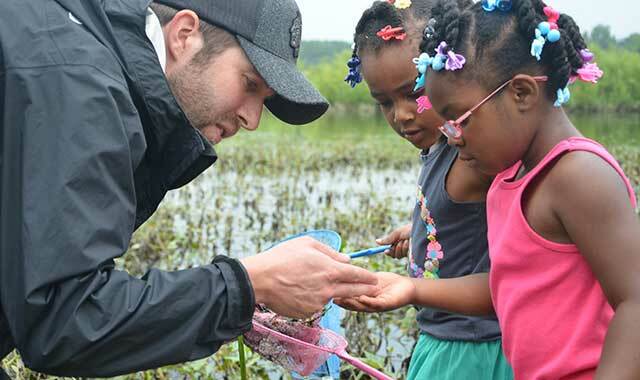 Families can explore blooming prairies and wetlands while visiting 12 learning stations during Family Nature Day, on June 23 at Nygren Wetland Preserve in Rockton, Ill.
Because of growing development, there isn’t as much land to protect in northern Illinois as there was 60 years ago. In addition to development, another threat to natural areas has become invasive species, especially the honeysuckle plant. “When you’re looking at a forest or woodland area, and if you look about midway between the treetops and ground and you see green bushes. A lot of that in our area is honeysuckle,” Johnsen explains. Also, raising money for the organization is always a challenge, Johnsen says. But fortunately, there are a lot of people passionate about protecting nature, so they want to give back. “There’s a cost of managing land because the more land we acquire, the more it costs to maintain or restore. We depend on volunteers and staff to manage and coordinate those types of activities and work,” she says. NLI accepts property donations, purchases land and helps property owners draft legal agreements that prevent land development or other harmful use of their land. Another challenge that the NLI faces is the continuing need for donations. A large chunk of NLI’s funding comes from individual donors. Other income streams come from bequests, corporate gifts, gifts of land and conservation easements, and income from endowments and other invested funds. “We’re always seeking funding to support our organization with equipment and staffing to manage land and the programs we provide,” Johnsen says. Volunteers are always welcome at NLI. More than 200 volunteers contributed 4,000 hours to the nonprofit in 2017. Volunteers can get their hands dirty by helping with invasive brush removal and land stewardship, among other things. “We can always use more people to help pull garlic mustard and cut honeysuckle,” Johnsen says with a laugh. Reisetter enjoys volunteering at NLI and wants more people to join him. Even though she works for NLI, Johnsen has a passion for volunteering as well. Throughout 2017, NLI’s 21-member Board of Trustees, various committees and staff put together a five-year visionary strategic plan. In the next five years, NLI plans to expand its conservation focus through three new initiatives to support its mission: the working lands initiative, the cooperative partnerships initiative and the community conservation initiative. These plans will be used as tools to build NLI’s sustainable future. “We have several committees and we started by having them discuss ideas on what they want to do for the next five years, based on what we’ve already been doing, and based on what we want to do,” Johnsen says. The working lands initiative is designed to provide cash flow to support conservation while being protective of the soil, water quality and microbiomes. “The working lands initiative is all about using agricultural land to fund land stewardship costs and management activities on our natural area preserves, as well as to provide corridors linking fragmented landscapes,” Johnsen says. The cooperative partnerships initiative seeks to expand the impact NLI and its partners could have on the region’s biological diversity and habitat. This initiative will look at partnering in more impactful ways outside of traditional partnering opportunities. The third initiative, community conservation, seeks to inspire and empower private property owners to implement habitat and conservation practices on their land and provide a personal connection to nature. It also strives to grow NLI by expanding its potential donor and volunteer base and increasing the organization’s visibility in the community. All of the ideas and planning that happen now and in the future at NLI are done with George Fell’s vision in mind. It’s safe to say George would be proud of the work NLI has completed over the past 60 years. The foundation he planted has blossomed into an organization that continues to grow. This entry was posted on Monday, June 11th, 2018 at 11:59 am	and is filed under Features, Top Posts. You can follow any responses to this entry through the RSS 2.0 feed. Both comments and pings are currently closed.